Palestinians and foreign activists damage a part of the Israeli security barrier near the West Bank town of Qalqiliya, on Monday, July 11. 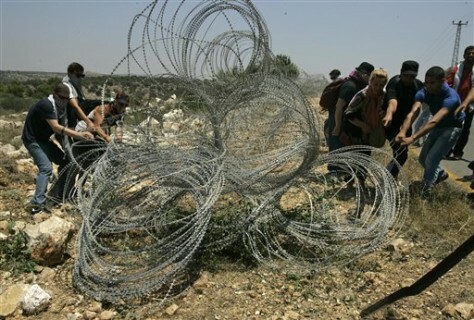 Witnesses say foreign activists have joined Palestinians in tearing down part of an Israeli fence in the West Bank Monday. They said some of the foreigners arrived in past few days, part of an effort to fly in protesters to demonstrate in the West Bank.